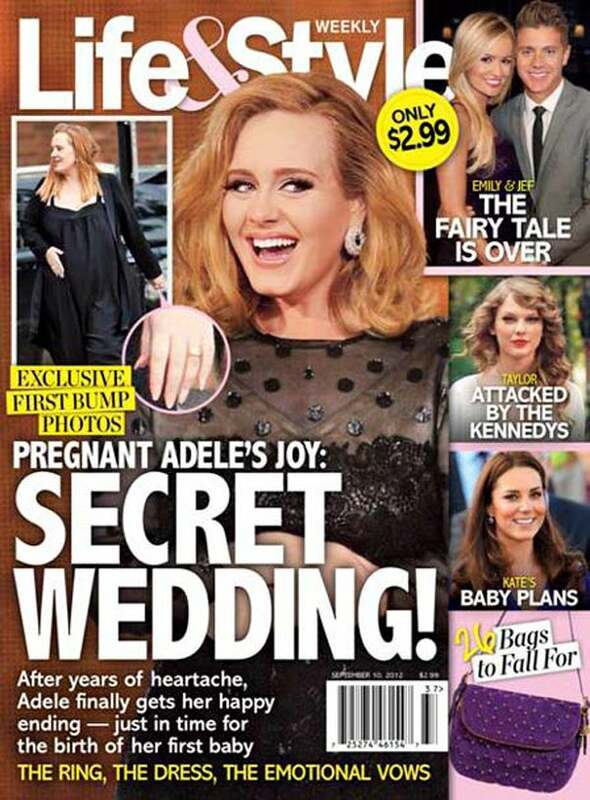 In case you didn't believe the news the first time around, there's no denying that Adele has a bundle of joy on the way. Life & Style 's latest issue (on newsstands now) prominently features photos of her out and about with her baby bump proudly on display (as it should be!) — and a wedding band to match. She apparently got married to longtime boyfriend, Simon Konecki, in a secret ceremony. It seems like just yesterday that the pregnancy was first announced, but apparently, the songstress is about a month away from giving birth! While we don't love to participate in the wide voyeurism that accompanies celebrities' private moments, we really feel like Adele would want us to follow every detail of her pregnancy. I mean, we are best friends, right, Adele? And this is what best friends do with each other! After all, it's all just a means to an end as far as we're concerned. Yes, we're talking about her eventual and inevitable recording of the most inspiring post-baby album in the history of pop. Can't wait. So happy for you, girl. Call us!